Hello Misfits! This is The Wrestling Classic here with my predictions for this Sunday’s Wrestlemania. The WWE returns to the New York/New Jersey area for the biggest show of the year. Its the Super Bowl of professional wrestling and it’s celebrating its 35th anniversary back near its home. The card is absolutely stacked but the build up for the matches hasn’t been that great. However, let it be known that in the past when the expectations leading into a show have been low, the show always seems to exceed expectations. Also, the WWE is known to pull out all the stops by going above and beyond for Wrestlemania to make sure the fans leave feeling it enjoyed. Regardless of the build or the card, the entire event is a spectacle and for even the casual fan, its an enjoyable time. This year’s Wrestlemania may be the longest one yet, being said to possibly go nearly 7 hours. History will be made during this women’s revolution once again, as the WWE Women’s Tag Team Titles will be defended for the first time at Wrestlemania and the three women fighting for the Raw and Smackdown Women’s Championships will be main eventing the show. 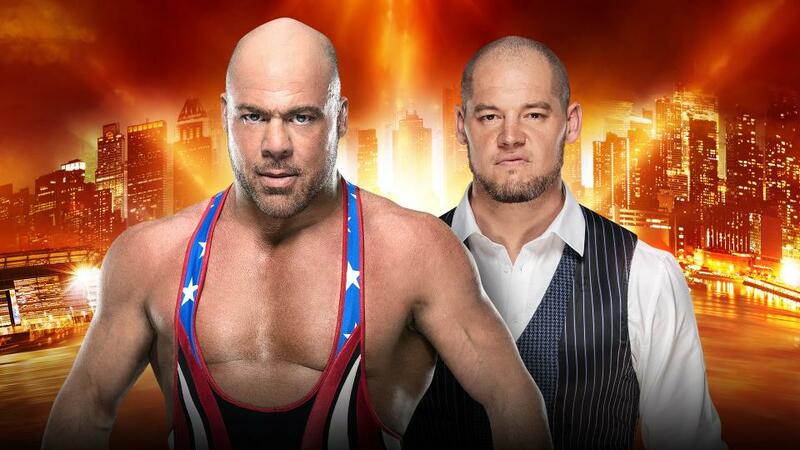 Kurt Angle wrestles his farewell match. Triple H puts his career on the line against the only man he has never been able to beat so he kept him close as an ally in Batista. 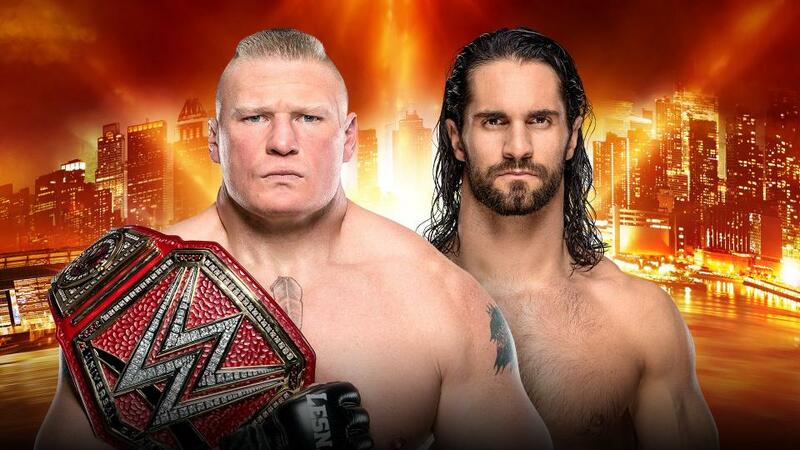 Seth Rollins will get his chance to try to dethrone Brock Lesnar bringing an end to the Lesnar Era by burning down Suplex City. 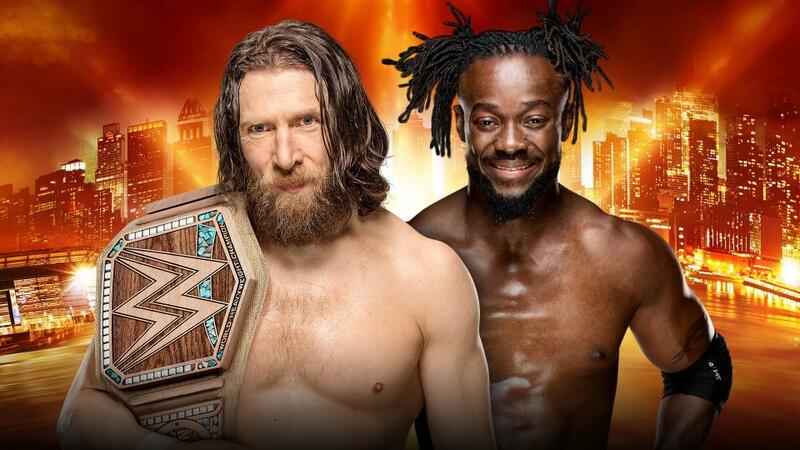 Kofi Kingston gets the opportunity to win the big one and have his cinderella man moment at Wrestlemania in a match that nobody saw coming throughout his eleven year career as he faces off against the NEW Daniel Bryan. 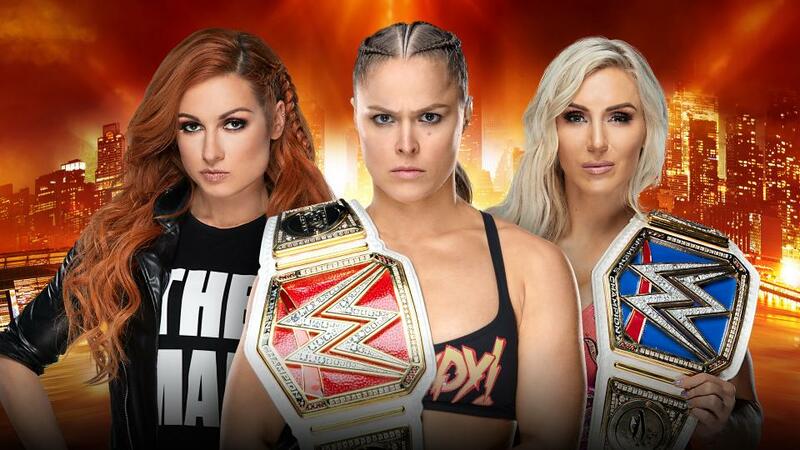 Becky Lynch, Charlotte Flair and Ronda Rousey finally all get in the ring together to settle their differences and prove who the real leader of the women’s division really is. I’m trying to get you all hyped up more than the weekly build up has been but lets see if I can predict this event. 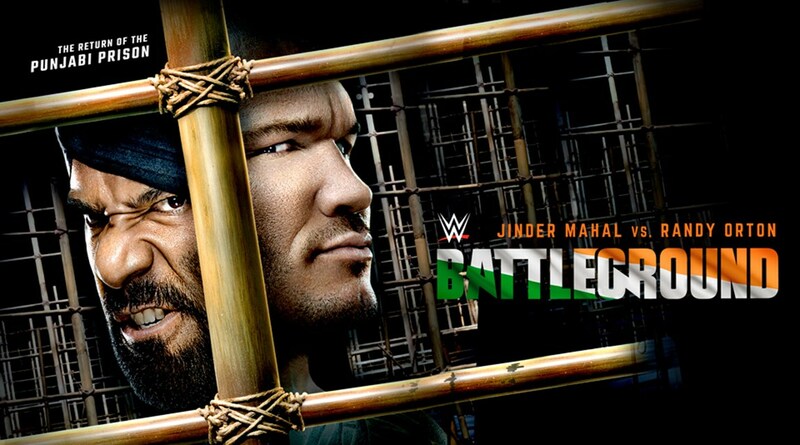 The Battle Royal which has become a staple to Wrestlemania since Wrestlemania 30 continues. If we’ve learnt anything about this Battle Royal it is that winning it, doesn’t really do anything for your career but it allows you to be on the card. 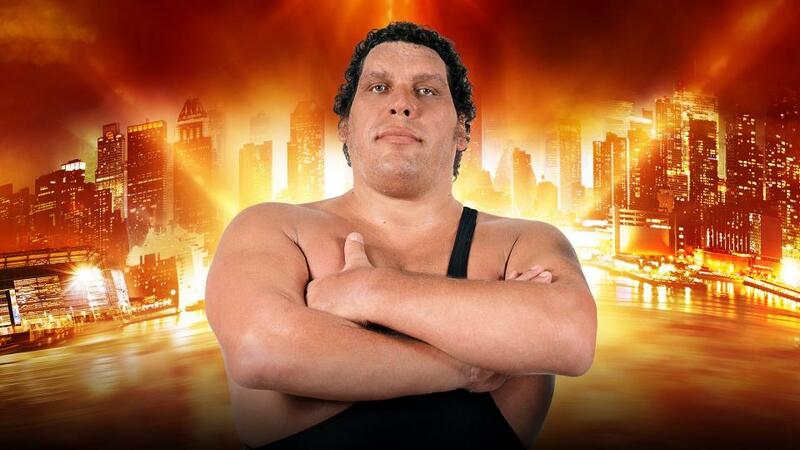 We have also learned that there are surprises in the Andre the Giant Battle Royal, for example we’ve had Shaq show up, Gronk and even Bray Wyatt return to help Matt Hardy win. This year two of the comedians from Saturday Night Live will be involved, in Colin Jost and Michael Che. They’ve been briefly feuding with Braun Strowman and that is really the only angle really going into this match. Everyone else involved are superstars who didn’t have any other important match or place on the card. This includes popular names such as Andrade, Jinder Mahal, The Hardy Boyz, Bobby Roode, Ali and The Club. As much as I would love seeing someone such as Andrade (I’m really rooting for him), Ali or Mahal (the man is a former WWE Champion) l pick up the surprise victory here, I feel like this win might end up just going to Braun Strowman. He really could be the first significant winner and needs to find a way to keep whatever little momentum he still has. Maybe Nicholas will come and help him against the SNL guys. This cruiserweight championship will once again be defended at Wrestlemania and just like previous years, has the potential to be the best technical match on the card. I like the choice of Tony Nese being Murphy’s opponent considering their history and the event being in the New York Metropolitan area where Nese. I still think character and story-wise I would have been more invested if it was Drew Gulak in this position but Nese is just fine. I mean Murphy won the title in his home country, so maybe Nese will win in his home state. I don’t think the reign ends here though and Murphy finds a way to remain the Cruiserweight Champion as 2019 rolls on. The question is who will seem like a formidable opponent to defeat 205 Live’s resident juggernaut? The Women’s Battle Royal returns for it’s second year as a new annual tradition. Similar to the Andre the Giant Battle Royal, winning is extremely pointless as last year Naomi won but never got the title shot I am almost 90% sure she was guaranteed. 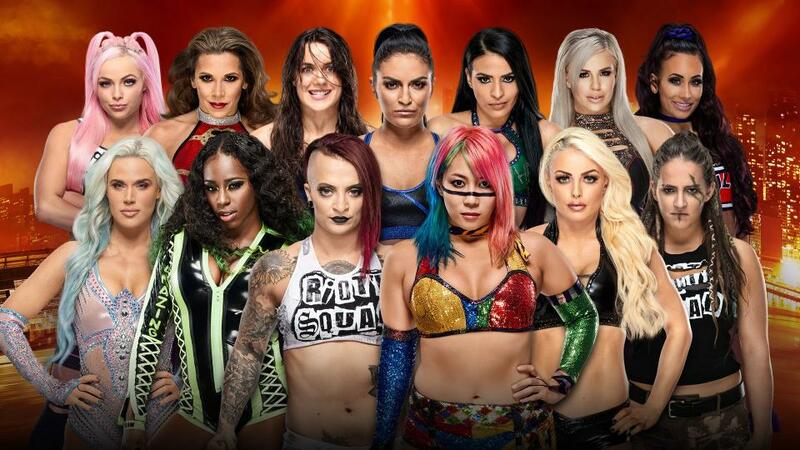 This is a great match to feature all the women who didn’t make the card else wise. It also has the potential to have some surprise NXT or legend entrants and the chance to tell some cool stories here between the women involved. I think the immediate favourite would be Asuka since many people thought she would be defending the Smackdown Women’s Championship on this show before losing it to Charlotte Flair last week on Smackdown Live. Although, I dont think the WWE should go in that predictable route. As much as I would love to see my girl Carmella win, I dont think that’s going to happen. I think the best bet is to make the winner be someone who I actually see getting a significant push this year and almost a shoe-in to be Women’s Champion by the end of 2019…Mandy Rose. They were once Team Best in the World, and now they explode. It’s another one of those former best friends but now bitter enemies storylines. They did change it up a little bit with Shane McMahon turning out to be the egomaniac by attacking The Miz when I think the majority expected the Miz too. The Miz is going into Wrestlemania with the fans behind him which is a rare occasion. This is Shane McMahon going into Wrestlemania as a heel for the first time since his return in 2016. Shane McMahon who won the “Best in the World” tournament when replacing an injured Miz in the finals back in November, has really got himself believing he is the best in the world. The Miz who instead of being angry about the situation, embraced it and in his mind brought himself and Shane McMahon close to the point where they even won the tag team titles. Shane McMahon got the Miz the recognition from his father that he always wanted and then beat him up in front of him. In the end, the only real conclusion this match can have is The Miz standing victorious celebrating with his father, Mr. Miz, in the middle of the ring. Finn is bringing out the Demon for this one. I knew he had to that or something like my other crazy idea such as McGregor coming out to even the odds by helping Finn. This match has happened 20x already so it needed something to feel special. Finn announced the Demon would be appearing this week on Raw which does create more intrigue but also makes you question why he didn’t bring it out for the Universal Championship match. Regardless what they do to make this match feel special, Lashley walks in champion and Balor walks out champion. Finn Balor deserves his big Wrestlemania moment which he hasn’t had yet. I mean even Lashley has a Wrestlemania moment by helping Stone Cold and Donald Trump shave Vince McMahon’s head at Wrestlemania 23. Let Balor bring out the Demon and add to the spectacle that is Wrestlemania while putting this feud to rest. WHOS THAT JUMPING OUT THE SKY?! MYSTERIO! HERE WE GO! Rey Rey is back at Wrestlemania for the first time since Wrestlemania 27. This time he is facing off with an opponent he would have never thought he was going to wrestle on the grandest stage of them all let alone in the WWE back in 2011 in Samoa Joe. Joe who has finally won his first major singles title on the main roster by capturing the United States Championship will defend it against Rey Mysterio. The United States Championship is the one title that Mysterio has never captured. As much as I would love to see Mysterio finally capture the one title that has alluded him all these years, this is Joe’s first Wrestlemania EVER, even though he’s been on the main roster since Wrestlemania 33. I think Joe is long over-due for a big Wrestlemania victory and that is what we’ll get here. Rey Mysterio doesn’t lose anything by losing here but Joe has everything to gain including more momentum for 2019. It was announced by the host of Wrestlemania Alexa Bliss that the Uso’s will be defending their Smackdown Live Tag Team Titles as a repercussion to them forfeiting to fight The New Day in the gauntlet match a week prior. The Usos will have to defend their tag team titles against The Bar, Rusev and Nakamura and the NXT team of Ricochet and Aleister Black. I think all four of these teams can give us a hell of a match and could literally steal the show if given enough time. 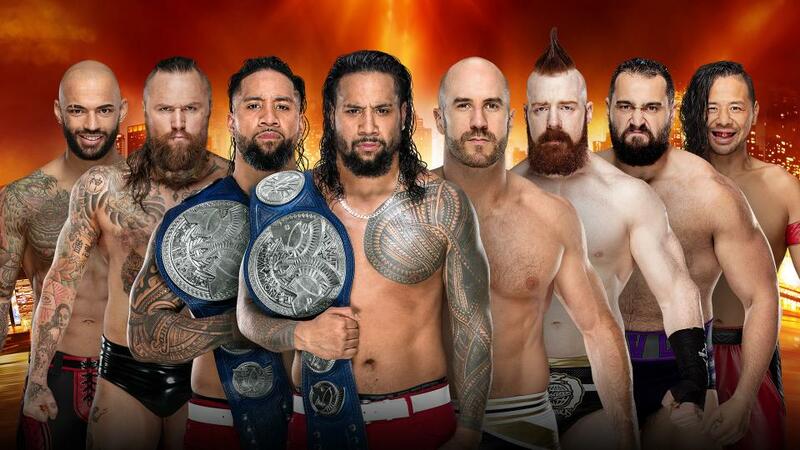 The Usos and The Bar are already established teams with multiple championship reigns. I would not mind The Usos retaining or The Bar winning the tag titles again. I’m all game for it. 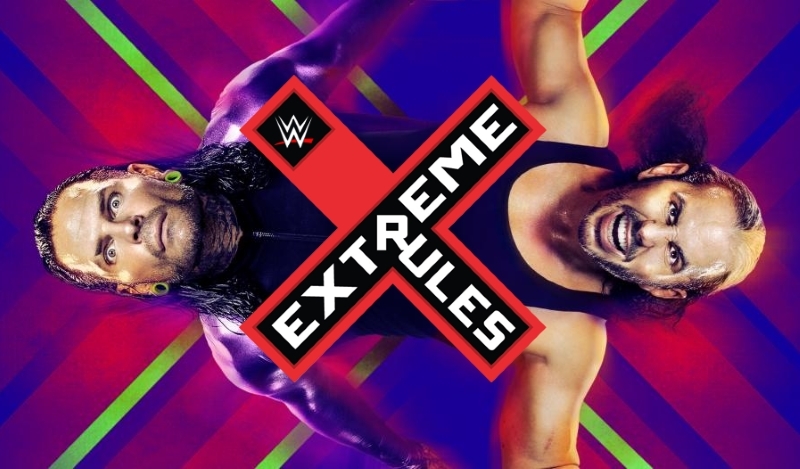 I love Shinsuke Nakamura and Rusev as individuals rather than a team, so as happy as I am that they are on the Wrestlemania card, I definitely don’t care to see them become tag team champions. I was against Aleister Black and Ricochet becoming tag team champions since they haven’t become exclusive to either show and technically are both still NXT stars but if they keep getting shots on both shows, they must eventually win…why not Wrestlemania? The Boss N’ Hug Connection make history as they are the first ever women to defend the new Women’s Tag Team Titles at Wrestlemania. 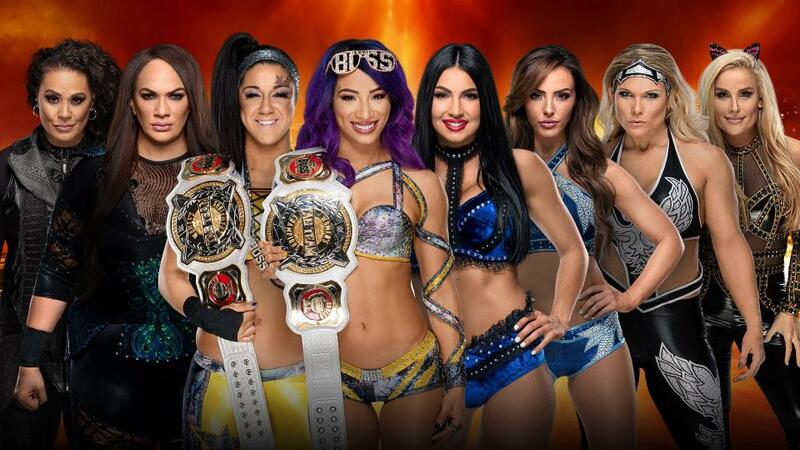 The real question now is will they be able to hang on to them or will one of these other three teams be able to make history by being the first ever women to win the Women’s Tag Team Titles at Wrestlemania. I’m not sure what Nia Jax and Tamina did to earn another shot at the tag titles but I can definitely see them as future tag team champions. Its just wild with actual teams like the Riott Squad or Many Rose and Sonya Deville, who were the runner-ups in the Elimination Chamber match, that Nia and Tamina keep getting shots. Speaking of actual tag teams, The IIconics deserve to be in this match for that exact reason. They’ve been a real tag team since day one and definitely deserve not only a shot at the belts but to be champions. The natural chemistry between the two and their background story of growing up together since high school and now both in the WWE really makes you want to root for these beautiful trash talking Aussies. Last but definitely not least, The Divas of Doom return to be the fourth team in this match. I know many of us were hoping for Trish and Lita but I am totally okay with Natalya and Beth Phoenix. Its great to see the Glamazon back in the ring and having Natalya back in an important match at Wrestlemania. In the end though, I feel like Sasha Banks and Bayley retain. I would love to see them lose and slowly head into a feud with each other like we’ve been waiting for since Bayley got called up, but I feel like they can start that after Wrestlemania and give the Boss N’ Hug Connection a Wrestlemania moment by successfully defending the tag titles at the big show. Lets have them drop it to the IIconics next month or so to start their feud but I really want that Four Horsewomen moment to end of this show. I feel like people are really sleeping on this match when it really has the potential to be a show-stealing hidden gem. These are two guys who are so organically good that they make it look easy when its not. It’s also another one of those matches that was just a dream just five years ago. 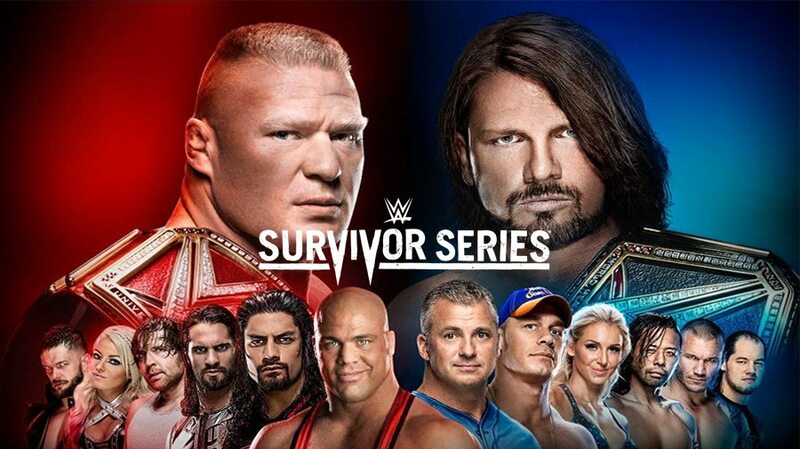 Similar to John Cena vs. AJ Styles, it almost feels like a WWE vs. TNA dream match. Both guys careers really took off in 2002, even though Styles was wrestling sometime before that, and they both were top stars in their organizations. Randy Orton is a product of the WWE whereas AJ Styles is a product of independent wrestling. 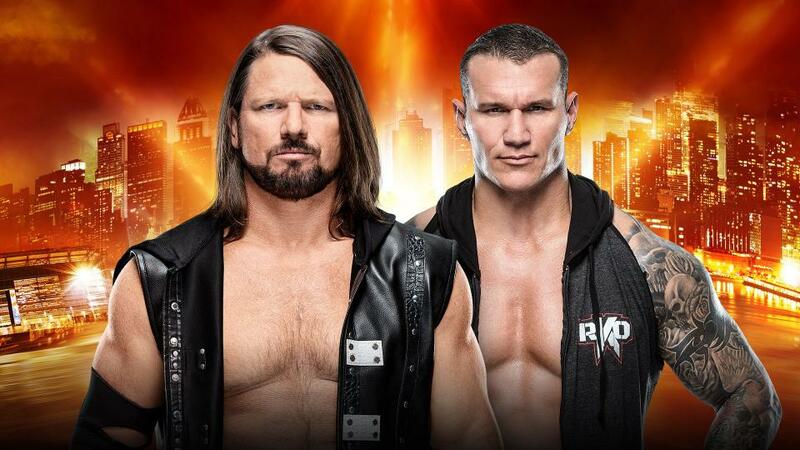 AJ Styles and Randy Orton have been exclusive to Smackdown Live for nearly three years and the WWE has been smart to keep them away from each other besides a match they had prior to Wrestlemania in 2017. AJ Styles remains one of the most consistent guys on the roster. Orton has proven time and time again that when he’s motivated and against the right opponent, he’s one of the best. Both of these guys will be motivated to steal to the show and leave us with an unforgettable Wrestlemania match. As much as I would love to see a RKO outta nowhere, I think AJ Styles gets one over on The Viper on the big stage. This feud is far from over though. This is another match I think that people are not talking about enough but has the potential to steal the show. Its two agile big men facing off in what you can expect to be a competitive brawl. Both men can go with speed and power. This is Roman Reigns first high profile singles match since returning to the ring after fighting leukaemia. 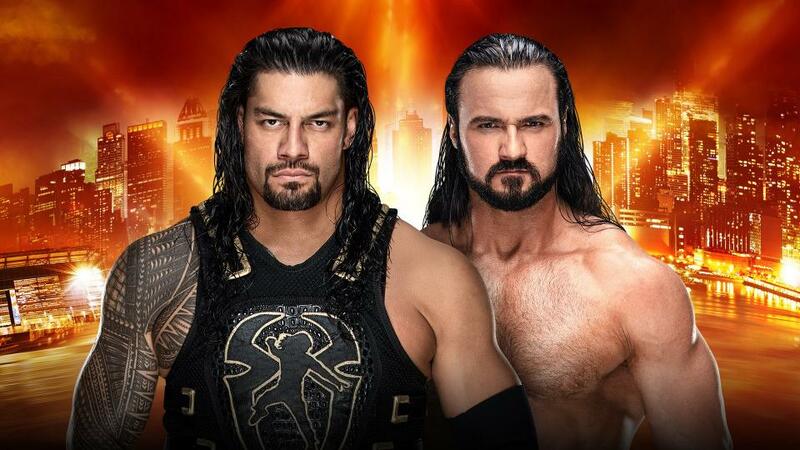 This is also Drew McIntyre’s first high profile Wrestlemania match since his return to the company. This is also the first time Roman Reigns is not going to main event Wrestlemania since Wrestlemania 30. Roman Reigns doesn’t really gain anything by winning here. He already had his big return match moment with the final Shield reunion at Fastlane. I really cant stress how big of a victory this would be for Drew McIntyre. I really do believe that the Scottish Terminator would prosper with a big victory over Roman Reigns at Wrestlemania and it would really cement him as a top star contender for the Universal Championship. I dig both guys. They were both “chosen ones” who didn’t quite go as planned, but I have to say I’m rooting for Drew McIntyre here. It took 11 years for this Cinderella story to come full circle but Kofi Kingston finally gets a singles shot at the WWE Championship. 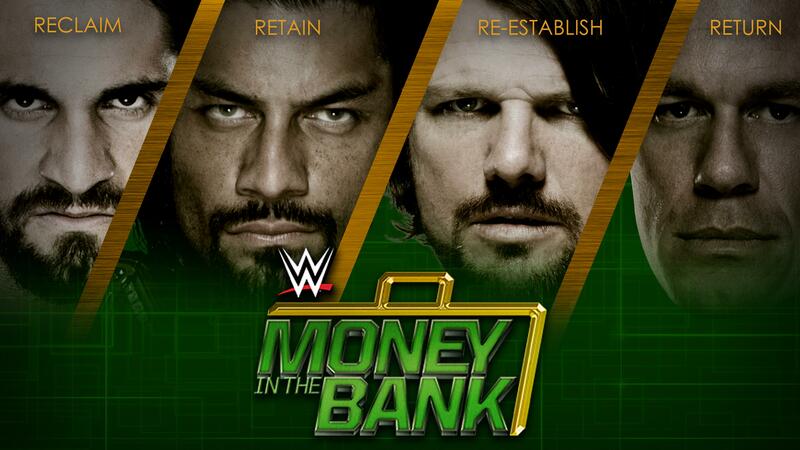 Its not only a singles shot for the WWE Championship but its on the grandest stage of them all. Its a great underdog story that the WWE has perfected telling. There isn’t a more fitting opponent than Daniel Bryan who himself had a great underdog story going into Wrestlemania 30. In many way, Kofi Kingston is in the same position Bryan was just 5 years ago. There is no better guy to put over Kofi Kingston than a guy who was once called a B+ player himself but overcame the odds that were against him. Kofi Kingston must overcome the odds at Wrestlemania and become the first ever African American WWE Champion to all of those who like to discredit The Rock. They could definitely swerve us but if there was any show that a moment like this deserved to happen on ti would be Wrestlemania. It’s time. Its Seth Rollins attempt to dethrone the Beast and burn down suplex city. He’s going to do whatever it takes even if it takes him everything he’s got. The story has been told that Lesnar struggles with his smaller and faster opponents as if he underestimates them. Whereas he can usually make quick work and brawl with his larger opponents. The matches that Lesnar has had since he returned in 2012 where it looked like he was going to be surprisingly beat have been against the likes of CM Punk, AJ Styles, Daniel Bryan and Finn Balor. Seth Rollins is also someone who has dealt with the wrath of Brock Lesnar in the past. When Seth was the WWE Champion he only escaped Lesnar due to a returning Undertaker. This is a different Seth Rollins now though. A more motivated and determined Seth Rollins. A Seth Rollins who is over a absent champion and wants to be the fighting champion that he thinks the people deserve. I really want Seth Rollins to go over but I feel like this might be another one of those situations where they make us believe that its almost a shoe-in that Lesnar is going to be dethroned but he still comes out victorious. I think I stress myself out thinking there is another show in Saudi Arabia after Mania and really on the fence if the WWE will give us three major title changes with Rollins, Kofi and Becky all winning. I do think there is a chance Lesnar wins but I have to stick with my gut and root for the Beast Slayer. 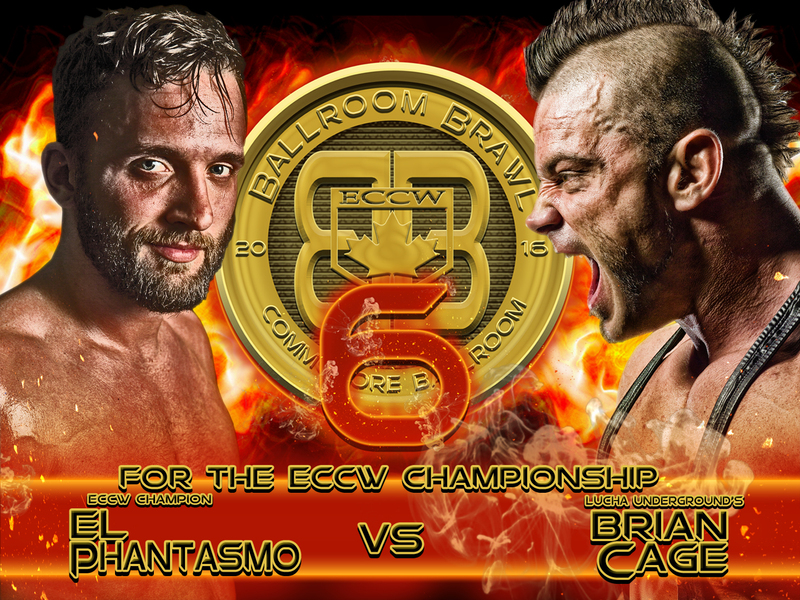 Its a match I’m excited about considering I was a huge Evolution fan between two legends. The story here is that Batista is the one guy Triple H has never been able to beat in a singes match so a confident Batista wants to be the one to put an end to The Game’s in-ring career if its the last thing he ever does in the WWE. It took years for Dave Batista to realize Triple H’s game of using him and keeping Dave on his good side, especially once he realized Triple H realized that he couldn’t beat him. Its like the relationship between King Alfred and Uthred from the “Last Kingdom” series on Netflix. Alfred never wanted Uthred as an enemy because he knew how powerful of a warrior Uthred was so it was better to keep him on his side at all costs. It’s the same story here but the only difference is Batista knows Triple H’s game and before he calls it quits on his wrestling career. Batista has wanted his final match to be against Triple H at Wrestlemania and has said so for so many years. I am really glad he is getting this match but I really dont want to see Batista lose to Triple H. I love the fact that The Animal is the one guy that the Cerebral Assassin has never beat and I dont want to see that change. Its like when Warrior went to WCW just to lose to Hogan. I’m also fine with Triple H being retired from in-ring action for a little bit and I say a little bit because I’m okay with him coming out of retirement a couple of years from now against a formidable young star who gets on his nerves. There is a part of me that thinks Triple H wins. He hasn’t won a match at Wrestlemania since 31 but I have to admit I’m rooting for Batista. For the first time in history the women will main event Wrestlemania. I dont mean main event like they call every other championship match but actually go on last to close the show. The women’s triple threat is the headline match of Wrestlemania this year. It really shows that the company has come a long way in 35 years. The story was simple at the beginning. 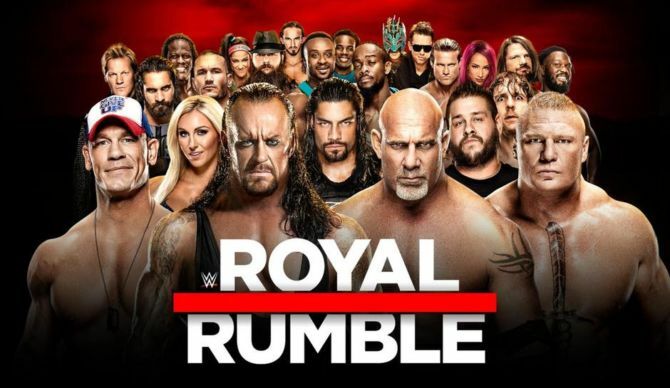 It was really simple all the way until after the Royal Rumble when it got super convoluted. Charlotte being added in by choice of Vince who stopped caring about anything else that happened afterwards. Becky being booted from the match only being forced to earn it back by beating Charlotte. Becky had an injured knee, Ronda turned heel, Charlotte won the Smackdown women’s championship and I swear at some point Ronda gave up her championship just to get Becky back in the match. Regardless, of how the confusing the angle got there have been many enjoyable moments such as this past week on Raw with all three women getting arrested and the match is bound to be entertaining. These are three women who are blast to watch in the ring. Becky Lynch is the hottest thing in the business and women’s division since last Summer. Although, it feels like it had cooled down since the Royal Rumble as the angles with Ronda and Charlotte came to the forefront, the fans are still behind The Man. 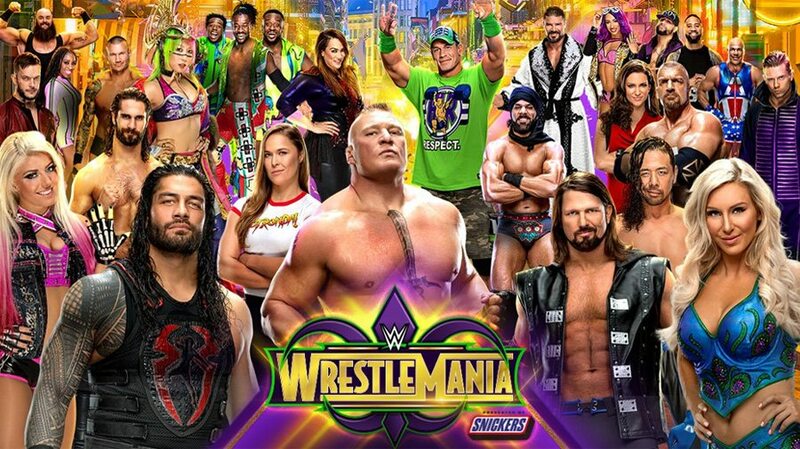 I believe if you asked a year ago the original idea for this year’s Wrestlemania was just Charlotte vs Ronda Rousey, the fact that Becky Lynch is involved shows how over she became over the past 8-9 months. Charlotte Flair is Charlotte Flair, and the eight time Women’s Champion deserves to be in this main event. I always say that Charlotte is the bar in the women’s division and if she was to retire tomorrow, she’s already had a Hall of Fame career. Try to fight me on that. I also dont think this would have been a possibility if Ronda Rousey wasn’t involved. Ronda Rousey in many ways is a house hold name in America. 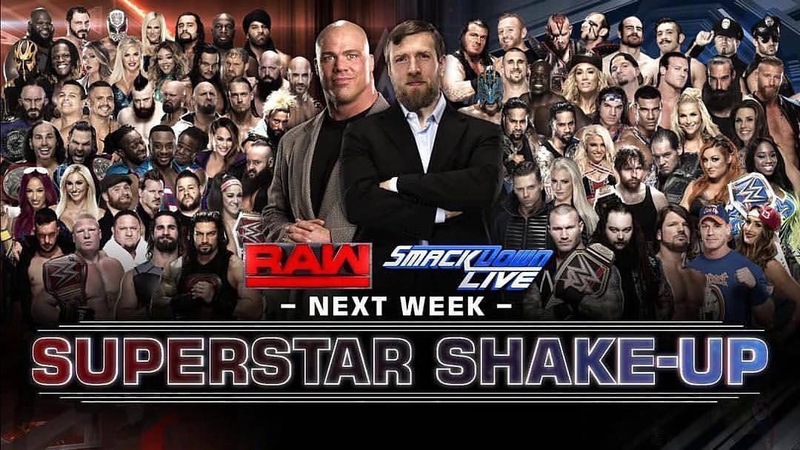 If there was going to be a women’s main event, it helps to have someone with her star power involved. They spent a year making Ronda Rousey feel unstoppable besides the times she’s stepped in the ring with Charlotte, Becky and Sasha. All three of those Four Horsewomen ended up bringing Rousey to her breaking point making her more dangerous than ever. I can totally see how they could swerve us by having Charlotte or Ronda win here in this winner take all match to throw us off. I still think this angle needs to end in the way we all predicted with Becky Lynch walking out with both titles. Charlotte taking the fall to keep Ronda Rousey strong? I can see it happening. I continue to stand with THE MAN. What do you think about my predictions for the Wrestlemania? What are your predictions? Do you agree or disagree with my thoughts and ideas of what might happen on the show? Leave your comments and opinions below. Very good and detailed comments. Becky is not the hottest thing anymore. Kofi is. This is such an iconic moment for the women’s division and that’s why I think Charlotte wins because Becky is not iconic. Ronda is not a WWE lifer. But she has done everything Vince has wanted her to do and more. Uso’s won’t lose and it should be a match vs the Hardy’s and no one else. Stick the rest in the battle royal and there is no need for SNL members to be in that match. I think Lio Rush turns on Lashley and Balor wins and hopefully we never see these 3 in another match together again. My gut tells me that Brock retains just because we all expect him to drop the strap. Instead he drops the strap in Saudi. The other matches I haven’t decided yet. I will be posting my full predictions by tomorrow.